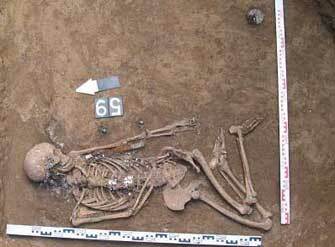 Catacomb burial ground (Kashkhatau settlement, the North Caucasus, the Kabardin-Balkaria). 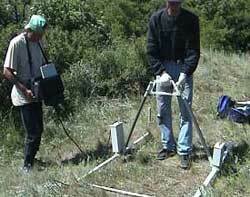 GPR prospecting was conducted by the members of the State Unitary Enterprise "Heritage", Stavropol (director A.B. Belinskiy, the leader of GPR group S.V. Merkulov). 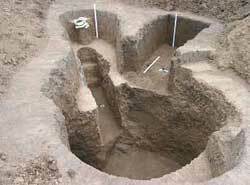 These excavations were conducted under the leadership of Biaslan Atabiev, The Institute of Archaeology of Caucasus, Nalchik. Buried ground catacomb (the screen copy of GPR "Loza"). Working episode of GPR investigation. With register (on the photo to the left) S.V. Merkulov. Ground tomb (the screen copy of GPR "Loza"). The catacomb burial ground after excavations. The specialists supposed that this tomb dates to the Alan culture period (7-9 centuries A.D.). Inside the woman's funeral was found a great number of different decorations, including: beads, earrings, mirrors, hangings, bracelets and a knife. All those things were made mainly from bronze.